There are 5 men from the Hallam family on the Marston War Memorial. In 1907 Arthur married Caroline Crawshaw in Braithwell, Yorkshire, where her father was a farm bailiff. In 1911 they were living with her parents in Braithwell and Arthur was working in the wire works. Arthur died in Yorkshire in 1957. In 1901 (aged 16) Ernest Walter (known as Walter) was living in Winthorpe, working as a footman for Jane Gilshap. He served in the Army (2nd Battalion, Rifle Brigade) from 1902 to 1905, becoming a Corporal. He served in South Africa (1902), Egypt and Sudan (1904). In 1907 he emigrated to Ontario where he married Ida. He became an insurance broker in Hamilton, then Port Arthur, where he served in the militia (91stRegiment). He then moved to London, Ontario as manager of the Continental Life Insurance company. In Oct 1914 he was commissioned as a Lieutenant in the 7th Regiment of the Canadian Army, but transferred to 18th Battalion (Western Ontario Regiment), perhaps after his brother Cyril joined the same unit in Jan 1915. They sailed for England in the spring of 1915 and spent the summer training at Shorncliffe Camp in Kent. By the time they arrived in France on 15 September 1915 Walter was a captain. The battalion went into the trenches at Wulverghen (Belgium, south of Ypres) on Sat 25th Sep.
Walter was killed on 29 Sep 1915, apparently during a diversionary attack. He seems to have been the first man lost from the whole Canadian 2nd Division. He was buried in Bailleul Communal Cemetery. In 1901 (aged 16) William was living and working (with cattle) at Breeder Hills Farm, Barrowby. By 1910 he was in the Barnsley area, where he married Amelia Spence. The following year they were living in Elsecar, where he worked as a carter for colliery firm. He died in Staincross, Yorkshire in 1959 (age 73). Amelia died in 1984. In 1901 Norman (as he was known) was living at home in Marston but working as a farm horseman (aged 13). In Feb 1904 (aged 18) he joined the Northumberland Fusiliers, but by 1911 he was with 1st Battalion, York and Lancaster Regiment in India. In 1913 he married Mabel Worthington (a relation of his mother?) in Annesley, Nottingham. When he died he was with 2nd Battalion, York and Lancasters. At the outbreak of WW1 they were based in Ireland but were rushed to the front in Belgium. They landed in France on 9 Sep and fought during at the Battle of Armentières, part of the ‘Race to the Sea’ as the Allied and German armies tried to outflank each other’s’ temporary defences by moving reinforcements north. In late October the Germans repeatedly attacked the newly-dug trenches held by 2nd Yorks and Lancs on the high ground between Armentieres and Lille. Norman was killed in action on 24th October and was buried in Bailleul Cemetery. John was working as a footman when joined 3rd Dragoon Guards in Ayr in 1909. The following year, at Aldershot, he was charged with desertion. During the war he became a sergeant in 13th Battalion, East Yorkshire Regiment. The battalion (known as Hull T’Others) was raised in Hull in Sep 1914 and trained in England before sailing to Egypt in Dec 1915. In Mar 1916 they moved to France, taking over a stretch of the front line opposite the village of Serre at the northern end of the Somme; suffering very heavy casualties as the battle was launched on 1 Jul 1916. John took part in the costly first day of the Somme campaign and was wounded on 21st July, but was soon back in action. He’d been awarded the military medal when, after loading himself with grenades, he destroyed a machine gun post and returned with the gun and 13 prisoners (the medal was presented to his parents in 1918). By the beginning of October 1916 heavy and persistent rain had turned the Somme battlefield into a quagmire. At 5.45 am on Mon 12th Nov the Hull Brigade led the final large British attack of the 1916 Somme campaign – the Battle of the Ancre. Advancing in fog just behind a creeping barrage they over-ran the German trenches, but where shelled and counter-attacked all day, before withdrawing that night after suffering very heavy casualties, including Sgt Hallam. His body was not identified and he is commemorated on the Thiepval Memorial. Cyril Hallam served 5 ½ years with the Kings own Yorkshire Light Infantry before emigrating to Canada in 1912, where he worked as a book-keeper and also served 18 months in the Canadian militia (96th Lake Superior Regiment) . In Jan 1915 joined 18th Battalion, Canadian Expeditionary Force at London, Ontario. He became a L/Cpl but in 1916 was training to be an officer at Pembroke College, Cambridge. Also in 1916 he married Marjorie Laura Park in Lambeth. She was an 18-year old artist and her father was an accountant. Cyril’s younger sister Mildred was at the wedding. After the war they lived in London before emigrating to Canada in 1928, with their daughter Marjorie and Betty and sons John Norman and Francis M.
By WW2 Cyril’s family were living in Sarnia, Ontario when their son John Norman (Jack) joined the Royal Canadian Air Force as a pilot. In April 1941 he was sent to England where he joined 82 Sqn RAF. 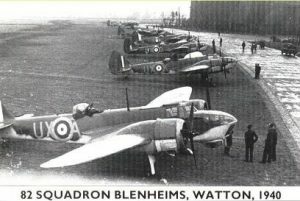 They were flying the Blenheim MkIV on anti-shipping strikes from RAF Bodney (south of Swaffham, Norfolk). On 12 July 1941 his aircraft (V6524) crashed into the North Sea in fog. He was 21 and is buried at Kiel war cemetery, in Germany. In 1909 (aged 17) Robert joined the Royal Field Artillery Reserve at Scarborough. He had already served in 5th battalion, Kings Own Yorkshire Light Infantry. He joined 513 Howitzer Battery as telegraphist. Two years later he was staying with his brother William in Elsecar whilst working in a mine as a coal hewer. He joined 29 Battery in France as a driver on 18th August. In Nov 1914 he was admitted to hospital in France with pneumonia. His mother applied for funds to see him in Rouen as he was dangerously ill, but he was later transferred to a hospital in Weymouth. He returned to the Royal Field Artillery and was promoted to acting bombardier, but remained in UK until returning to France on 1st May 1917. On 26 Nov 1917 he was admitted to Boulogne Hospital with a severe gunshot wound to the right shoulder and sent back to England again. He returned to France in Apr 1918 and remained there until Feb 1919, when he was de-mobbed at Harrowby Camp. His de-mob address was Church Villas, Marston be he seems to have returned to Yorkshire. He died in the Doncaster area in 1972 (age 79). In 1911, aged 16, Leonard was farm a labourer. In the Great War he enlisted in 9th Battalion, Kings Own Yorkshire Light Infantry. The battalion formed at Pontefract in Sep 1914 and landed in France in Sep 1915, being sent as reinforcements in the Battle of Loos before they’d even seen the trenches. 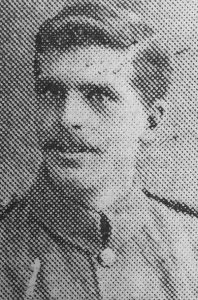 Leonard was killed in a machine gun accident on 23rd Mar 1916. He is buried in Outtersteen Cemetery, Bailleul.